Inspired by the graphic qualities of sea defences as depicted in prints of Paul Nash, inperprted in breakwaters observed on a birthday trip to Bexhill-on-Sea. The patterns of the waves moving around these structures are ever-changing: the seascape constantly re-made. The techniques are based on a novel approach to repurposing of textiles: the breakwaters are constructed of Japanese kasuri fabric from vintage kimonos inserted into slots cut into a section of an old, tattered, hand quilted Durham quilt. The quilt background was then coated in gesso and machine stitched from the front and also from the back with thicker thread in the bobbin. 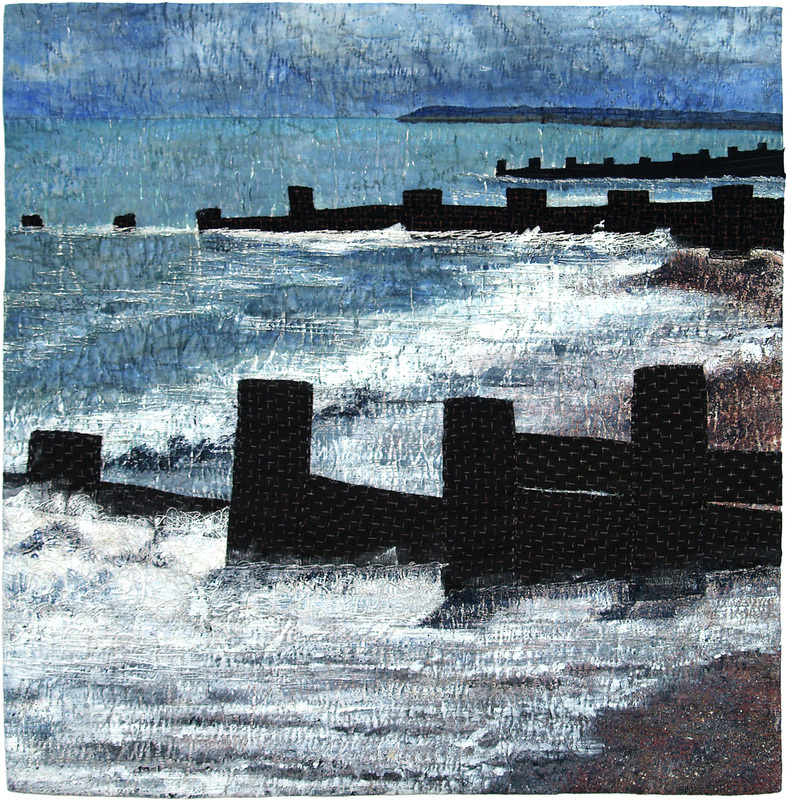 Finally, acrylic paint was applied over the stitching and the breakwater structures loosely tacked down with hand stitches. Materials: Vintage Japanese kasuri fabrics, recycled tattered Durham quilt. Techniques: Gesso, machine stitch, acrylic paint, hand stitching.